33 Fairfield is located on the west side of Fairfield, between Commonwealth and Newbury, with 31 Fairfield to the north and 35 Fairfield to the south. 33 Fairfield was built in 1877-1878 for banker and real estate investor Asa Perkins Potter, one of eight houses, four on each side of the block: 31-33-35-37 Fairfield on the west and 32-34-36-38 Fairfield on the east. He and his wife, Delle (Sheldon) Potter, lived at 29 Fairfield, built at about the same time. Click here for an index to the deeds for 33 Fairfield. On August 26, 1878, Asa Potter sold 33 Fairfield to Silas Merrill. The deed included an easement reserving a three foot wide strip across the western boundary to provide access to the alley for the houses to the south. 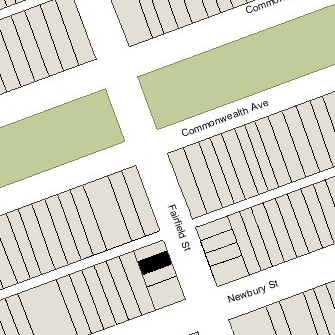 A similar easement was included in the deeds for 31 and 35 Fairfield. Silas Merrill subsequently mortgaged the house and then conveyed it back to Asa Potter on August 28, 1878. On October 18, 1878, 33 Fairfield was purchased from Asa Potter by George W. Terrill. He lived at 9 Brimmer. In December of 1878, he married Susan Tolman Covell. After their marriage, they lived at the Hotel Bristol (northwest corner Clarendon and Boylston). By the 1879-1880 winter season, 33 Fairfield was the home of Lemuel Rice Howe and his wife, Martha Ada (Silsby) Howe. They previously had lived at 337 Marlborough. He was a dealer in dyewoods, analines, and extracts, and later also was a commission merchant in the Calcutta trade. At the time of the 1880 US Census, taken in June, the Howes were living in Sharon, Massachusetts, where they appear to have maintained a second home. 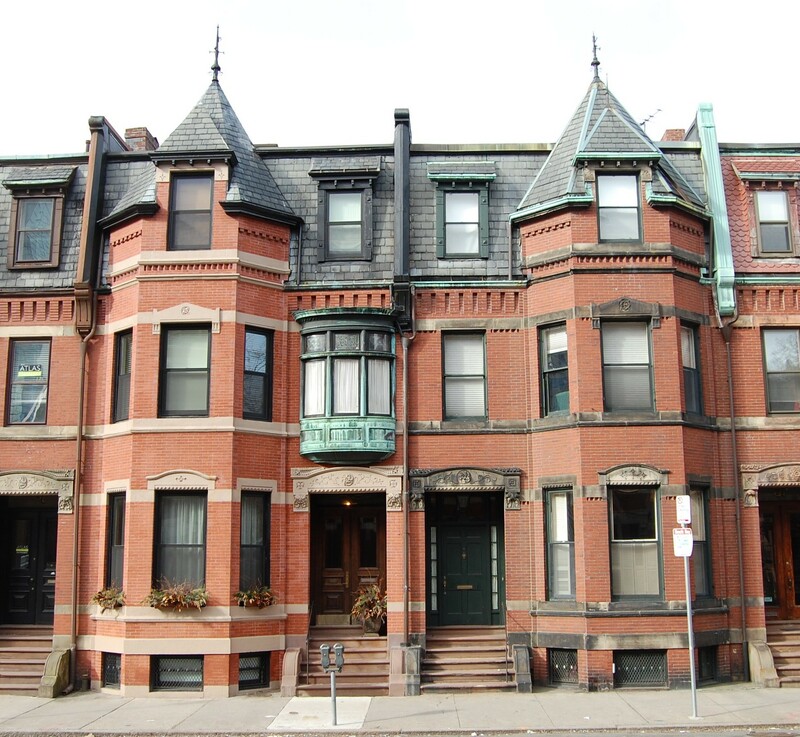 The Howes continued to live at 33 Fairfield during the 1881-1882 season, but moved thereafter to 391 Marlborough. 33 Fairfield was not listed in the 1883 Blue Book. On May 18, 1883, 33 Fairfield was purchased from George Terrill by retired merchant Jonathan French, a widower, who lived at 42 Commonwealth. By the 1883-1884 winter season, 33 Fairfield was the home of Jonathan French’s son and daughter-in-law, Aaron Davis Weld French and Elizabeth French (Davis) French. They previously had lived at the Hotel Kempton at 237 Berkeley. Aron D W. French was a shipping merchant. Elizabeth French died in September of 1891, and Aaron French died in October of 1896. On February 24, 1897, 33 Fairfield was purchased from Jonathan French by Henry Harrison Sprague. In June of 1897, he married Charlotte Sprague Ward and they made 33 Fairfield their home. 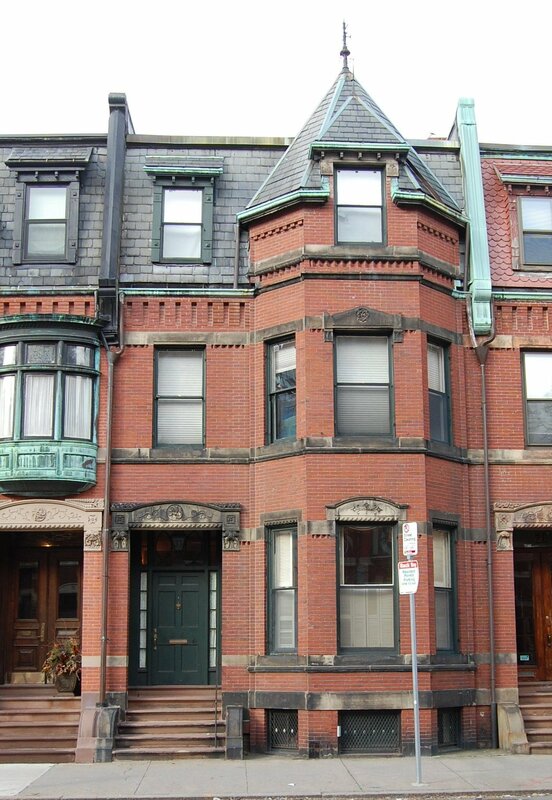 Prior to their marriage, he had lived at 9 Tremont Place and she had lived at 337 Marlborough with her sister, Annie Norton Ward. Henry H. Sprague was an attorney. He served as a member of the Massachusetts House of Representatives in the early 1880s, and as a member of the State Senate from 1888 to 1891, including serving as President of the Senate in 1890 and 1891. As a legislator, he authored significant election reform legislation, including the introduction of the secret (or “Australian”) ballot. Henry Sprague died in July of 1920. Charlotte Sprague continued to live at 33 Fairfield until her death in July of 1937. On November 8, 1939, 33 Fairfield was acquired from Charlotte Sprague’s estate by William Hobbs Goodwin, III, and his wife, Ruth (Kempton) Goodwin. He was a stockbroker and investment counselor. They continued to live at 33 Fairfield until Ruth Goodwin’s death in January of 1990. In April of 1991, 33 Fairfield was acquired from William Goodwin by William M. Bulkeley and his wife, Debra (LaCava) Bulkeley. 33 Fairfield a single-family dwelling in 2016.